As consumers and businesses embrace technology they are revolutionising the way they communicate. They are becoming more reliant on computers and social media and the insurance industry is using more data sources. We need to ensure that data protection and ownership are given greater consideration. SMEs might believe that because they are small, they will not be a target for hackers, however that may make them even more of a target. of a supply chain with larger firms and so present a back-door into bigger organisations with more sophisticated cyber security in place. BIBA is an active member of the Cabinet Office’s Cyber Insurance Industry Forum. More businesses than ever before are being attacked, hacked or having sensitive data lost or stolen. The Government’s Cyber Essentials scheme aims to provide a platform of cyber-hygiene that firms can build upon, reducing their risk of attack. The Cyber Security Information Sharing Partnership (CiSP) will help alert businesses to the latest threats and confidentially share information relating to attacks. The May 2017 outbreak of a ‘ransomware’ type of computer virus called WannaCry, affected users in many countries around the world including firms such as FedEx and many NHS trusts. It is believed to have led to 57,000 infections in 99 countries. Ransomware is a type of malicious software that locks and encrypts a user’s files until a random is paid. Cyber security experts strongly advise against paying a ransom as there is no guarantee that the files will be decrypted and the user is often placed on a list of people who pays ransoms – making them more of a target in future. WannaCry exploits a vulnerability in Microsoft, which released a software patch to fix it in March. However, many users fail to install updates and patches on their computers meaning vulnerabilities can remain open a lot longer and make it easier to exploit. You can take steps to protect against attack. Follow the tips from CFC underwriting. 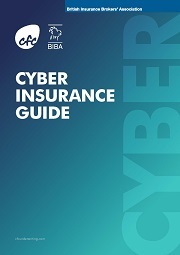 This straightforward guide, brought to you by CFC Underwriting on behalf of BIBA, explains how cyber risk and insurance has evolved and how a good cyber policy addresses these modern exposures. – To work with industry partners to make it easier for brokers and their customers to understand key differences in coverage between cyber insurance policies. – To continue to act as a sponsor for the National Cyber Security Centre’s Cyber Security Information Sharing Partnership (CiSP) – a joint industry and Government initiative to exchange cyber threat information. – To share good practice and guidance for insurance brokers to help them help their customers to understand and manage cyber risk.